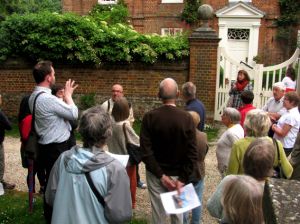 This year’s walk around Princes Risborough was led by David Green, Landscape Adviser to Bucks County Council. 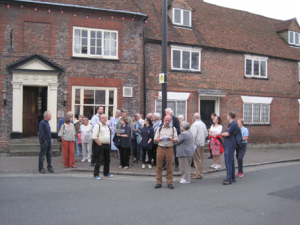 The HA group met David at St Mary’s church where he introduced the town by noting that Risborough lay at the foot of the Chilterns but close to a gap in the scarp. A series of Anglo-Saxon charters and wills relating to Princes Risborough and the adjacent Monks Risborough – the earliest dated to AD 903, made the early development of the town of particular interest. However, there had been little archaeological investigation here (much of its historic core lies is in a Conservation Area). It was, nevertheless, still possible to deduce some interesting facts from the town plan. From St Mary’s church known to have been in existence in the twelfth century but probably with earlier origins, the next stop was the adjacent car park. In the 1950s the car park had unfortunately been constructed precisely on the site of the early manor house. During the mid fourteenth-century the manor had been held by Edward the Black Prince when it had an important role as a stud farm. The manor was demolished in the seventeenth century. Archaeological excavations just prior to construction of the car park had uncovered parts of the manor complex (published in Records of Buckinghamshire). David noted a playing-card shaped set of boundaries which may have contained the early manor, and possibly the church and the suggestion was made that these might indicate the bounds of the early town. The group next admired the present ‘Manor House’ (formerly Brooke House) on Church Lane, a building first mentioned in 1589, before moving on to the picturesquely named ‘Monks Staithe’, a fifteenth-early sixteenth century building. The next stop was the Market Square an early feature of the town with some surviving buildings of fifteenth- century date. In the adjacent High Street, David pointed out the different size plots on its east and west sides indicating different phases of development here. A final suggestion concerned routeways. Where the road from Aylesbury enters the town it takes a left turn south-east along the High Street. 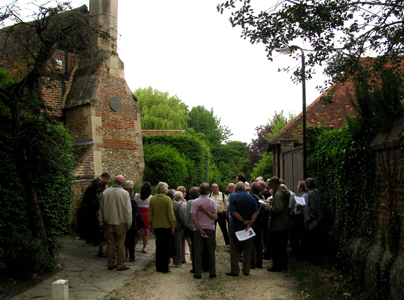 David suggested that the existing road to the south-west passes the church and earlier manor house could formerly have been its earlier course, continuing on westwards via Horsenden and Bledlow to Chinnor. Actress Grace Kelly and Prince Rainier of Monaco were married. The religious ceremony took place April 19.